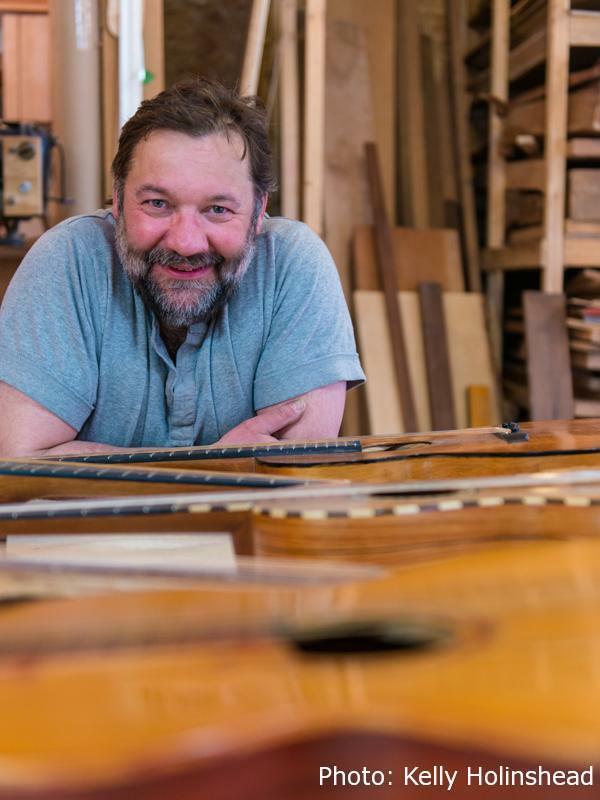 David Cureton has been building and designing acoustic guitars, harps, bouzoukis and dulcimers on a commissioned and speculative basis since 1990 in Vancouver and Nelson, BC, and most recently in the Muskoka area of Ontario. He received his initial training from luthier Michael Dunn in Advanced Musical Instrument Construction at Douglas College from 1988-1990, where he focused on the construction of acoustic guitars using traditional Spanish techniques. Upon graduation, Cureton established his studio in the east end of Vancouver and began developing his career while continuing to work as a finish carpenter and cabinet maker. In 1994, he began building harps and currently makes three different styles of harp utilizing box, roundback and staved back constructions. He was invited to lecture at the first annual Tone Wood Conference organized by Island Mountain Arts and the Wells Forest Woods School on “The Needs of the Custom Built Musical Instrument Industry.” In 2001 he published an article entitled “Harps, Soundboards and Alternative Woods” in Harp Light Magazine . In 2003, he moved his practice to the Muskoka region of Ontario where he resides with his partner, textile artist Hannah Lin. Building musical instruments is a multi-dimensional art. It involves a set of select woodworking skills, an appreciation of material and an individual vision of the final instrument. As an instrument is built, each piece of wood offers its own individual character and acoustic possibilities. It is perhaps one of the most intimate relationships a woodworker can have with his material. Initially my interest as a luthier was in exploring the work of my predecessors. The most radical examples of this are the Mary Kate Harp, the Romantic Guitar (after Coffe Gougette) and the Classical Guitar (after Torres). Within this framework I developed my ideas on bracing and soundboard voicing. Everyone needs a starting point. I strive for a well balanced robust instrument. 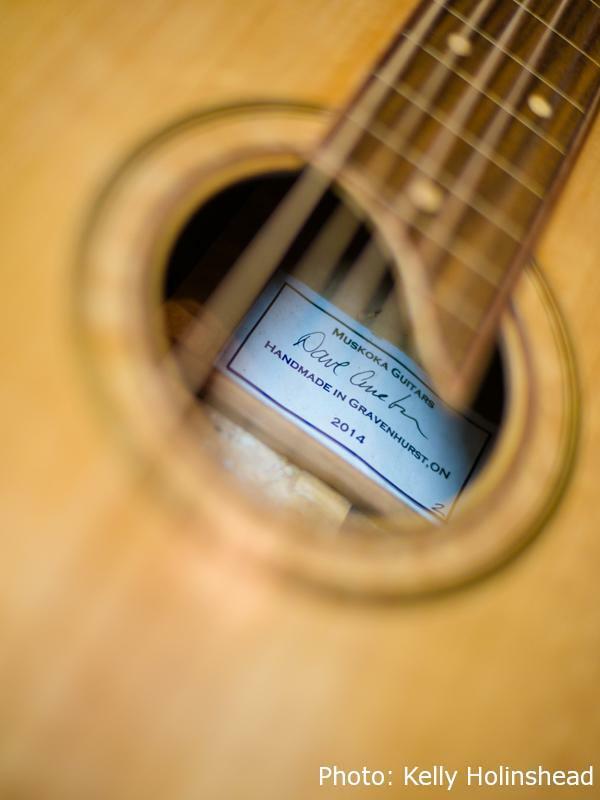 My guitars are built in the Spanish tradition using select exotic and local hardwoods and only the finest quality soundboard woods: Sitka and Englemann spruce, red cedar, Alaskan spruce. The Spanish neck/body joint (which makes the neck an integral part of the instrument as opposed to a bolt on or dovetail joint) has an acoustic benefit in sustain and volume.